HomeNew Lotions for 2019Devoted Creations FUEL MY FIRE Hot Intense Tingle - 12.25 oz. 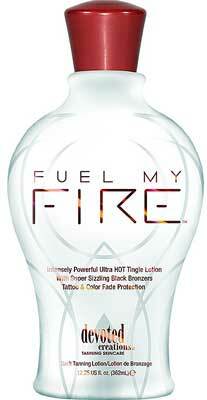 Devoted Creations FUEL MY FIRE Hot Intense Tingle - 12.25 oz. Devoted Creations BLACK OBSESSION ultra black bronzer - 13.5 oz. California Tan AXIS NATURAL BRONZER Step 2 - 8.5 oz. California Tan AXIS Intensifier Step 1 - 6.8 oz. California Tan CT SEVEN BRONZER Step 2 - 6.8 oz. Australian Gold CURRENT MOOD Exhilarating Dark Bronzer - 8.5 oz. Designer Skin REPUTATION 19 X Bronzer -13.5 oz.